Chef Plotkin is truly passionate about helping as many people as possible enjoy healthy, delicious meals. And his culinary coming-of-age tale is as layered and complex as the meals he cooks up. 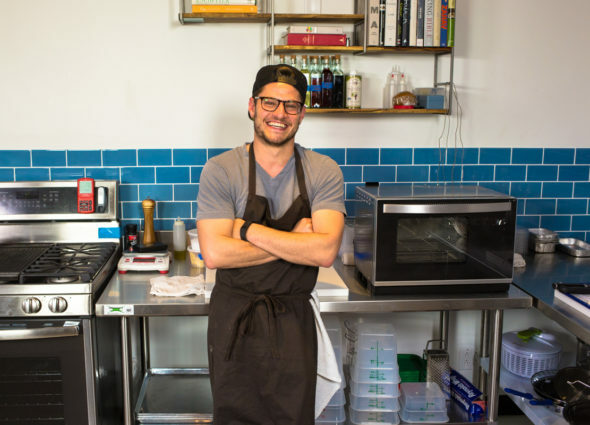 We sat down to talk to him about how he became a chef without going to culinary school, why healthy eating is so important to him, and how he uses a pretty vast amount of food savvy to create delicious meals! 1. Weâ€™ll start with a hard-hitting question: How did you become a chef? I grew up eating beautiful home-cooked meals seven days a week, and appreciating food that was homemade and not processed. I ended up working at a French restaurant in high school because I really just wanted to learn more about restaurants. And I didnâ€™t want to go to culinary school. I wanted to go to a university and get a food science degree because I was always fascinated by science. I knew I learned better actually working the line in a restaurant, and I wanted a food science degree to build that foundation. 2. So tell me more a little more about your unconventional culinary education. My culinary school was traveling the world, telling chefs, â€œIf you give me a bed to sleep in, Iâ€™ll work for free.â€� During college, I lived in San SebastiÃ¡n, Spain, one of the best food cities in the world, more Michelin stars per capita than any city in the world. I was working at restaurants while still doing school. And then I spent time working in Italy, working with these two sisters in the hills of Tuscany. During the day, I was learning authentic Italian dishes from these sisters, and then at night, I was learning how to make grappa from this Italian grandfather. It was an incredible gift. 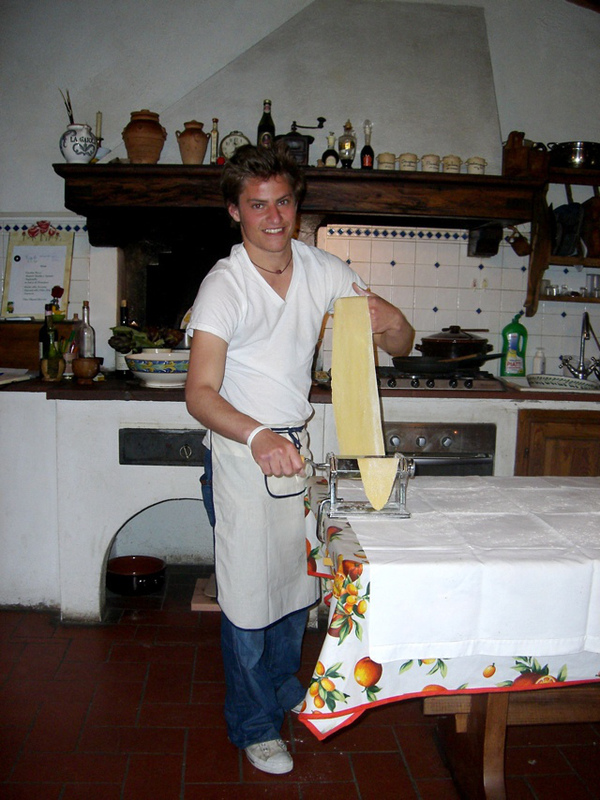 Chef Plotkin making fresh pasta in the home of the two sisters in Tuscany. 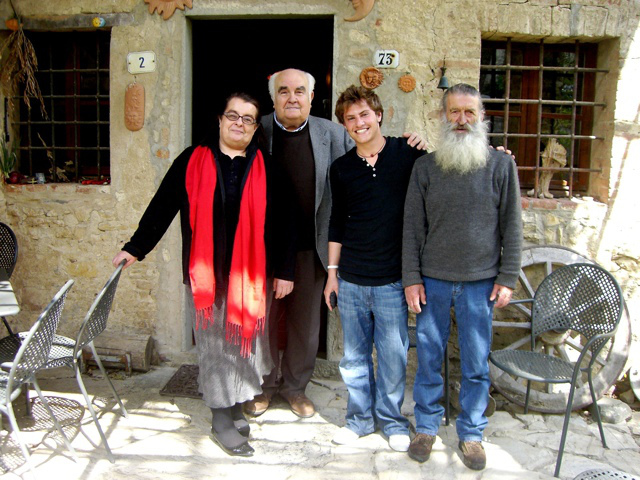 Chef Plotkin (second from right) with the Italian man who taught him how to make grappa (farthest right). I also spent time in Florence, where I became friends with the people at Acqua Al 2, a restaurant there, and eventually I became the chef at their third location in Washington, D.C. when I graduated from college. 3. It sounds like that led you into the world of fine dining. How did you end up at Noma? For two summers during college, I worked at Alinea. That really shaped my mindset of how a kitchen should be run, and I knew that after working there, Iâ€™d be ready to work at other fine dining restaurants. That opened the door into that world. I ended up moving to Copenhagen to work at Noma after working in D.C. That was huge for me. At the time, it was the number two restaurant in the world. I worked in the test kitchen with crazy ingredientsâ€”reindeer tongue, live ants, you name it. How do you plate live ants? It was wild! I learned so much and became incredibly close with RenÃ© [Redzepi, chef and co-owner of Noma]. I really learned how to taste things and the importance of exploring, trying, and failing in the kitchen. You need to burn things, drop things, to find the absolute best way to go about things in the kitchen. 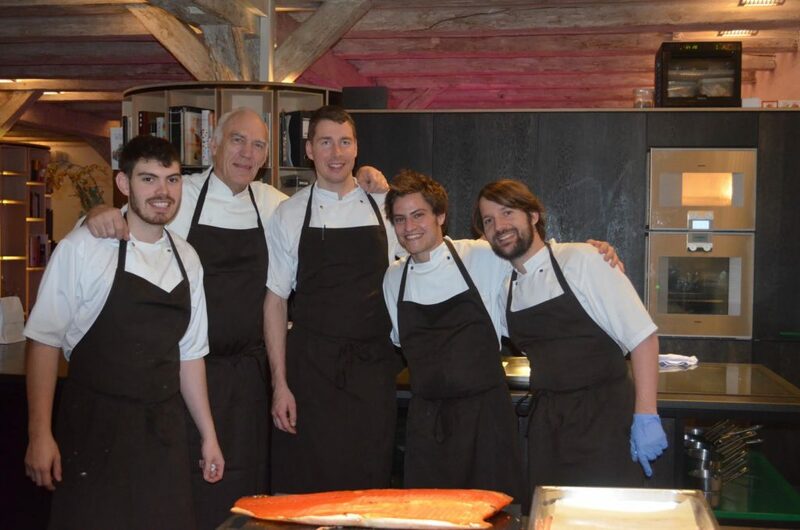 Chef Plotkin (second from the right) with the Noma test kitchen team, including Chef RenÃ© Redzepi (far right). 4. Would you say working at Noma was your most formative experience as a chef? Noma definitely made me the chef I am today, but Iâ€™d say my most formative experience was actually when my father was diagnosed with Non-Hodgkin lymphoma. He was going through chemotherapy. Hospital food was not great. So I became his personal chef, cooking breakfast, lunch, and dinner. Learning the importance of healthy food, seeing how the food I fed my father contributed to him beating cancer, really gave me a passion for feeding mass amounts of people in that manner. That led me to Kerry [Ingredients and Flavours] and to see if I could put my thumbprint feeding the masses. And thatâ€™s why I love Tovala so much. I feel like Iâ€™m helping so many people eat healthily, easily. 5. Working for Kerry sounds like a bit of a transition away from fine dining and into food development and innovation. Why did you make that move? Before I worked for Kerry, I was working with Omar [Homaru] Cantu at his food innovation firm and eventually as his director of culinary innovation. That meant a lot of cool projects with SpaceX, Whirlpool, etcetera. And then when Omar passed away, I started my own food innovation firm and continued on with these projects. I had already learned about how the very lucky few get to eat at fine dining establishments. It was time to learn how everyone else eats and to help them eat better, and that was something I was so excited to do. This was a direct result of cooking for my father while he was sick and seeing how food helped him, and thatâ€™s what lead me on the path to Tovala, ultimately, where Iâ€™m really getting to help the masses eat better. 6. How do you take advantage of your diverse and extensive experience at Tovala? Menus I create here at Tovala, I donâ€™t like to stick to one kind of cuisine. Aspects of all my experiences in the past are in the Tovala menu: flavors, techniques, seasoning. I love to tie my past experiences into what Iâ€™m doing today. When Iâ€™m creating a pasta dish, I jump back to those two sisters in Tuscany and how they taught me to make really incredible, authentic food from simple ingredients. When I set off creating new recipes in general, I take that attitude I learned at Noma and just go for it, trying unique ingredients, pulling together flavors in an exciting way, not afraid to fail along the way. It all comes together. Chef Plotkin in the Tovala test kitchen. 7. What does cooking with clean ingredients mean to you when youâ€™re creating meals for the Tovala? Creating Tovala Meals is a lot of reverse engineering in the sense that weâ€™re taking a recipe and a flavor profile that is usually utilized certain more traditional ways, and putting it together in a way that works really well in the Tovala. But weâ€™re creating real food here, and thatâ€™s the bottom line. My foundation as a chef comes from clean ingredients, and Iâ€™m using clean ingredients to make these meals really great. 8. Do you have a favorite Tovala Meal? I love the Thai Turkey Meatballs. They were developed by my Sous Chef Erik and were one of the first things that just highlighted how talented he is as a chef. Theyâ€™re incredibly tasty, and I find myself craving them. As soon as I find myself craving something, then I know itâ€™s a winner. Craveability is everything in the food world. 9. Is â€œcraveabilityâ€� something you aim for when youâ€™re creating Tovala Meals, aside from making them really healthy and delicious? Absolutely. Chefs typically donâ€™t love eating their own food, so if thereâ€™s a dish I want to eat on a regular basis thatâ€™s my own food, then Iâ€™m pretty confident itâ€™s a â€œcraveableâ€� dish. I hope the people who eat Tovala Meals end up craving what we come up with, too! Check out the latest Tovala Meals Chef Plotkin has brought to life!